This Advanced Disk Test, which is part of PerformanceTest, measures the data transfer speed when reading or writing data to one or more disks. The speed that data can be transferred between memory and a hard disk drive is one of a system's most important performance aspects. There are quite a few factors which have a bearing on this speed and the Advanced Disk Drive Test allows the user to vary most of these factors and compare the results. The test supports any drive that can be mounted under Windows. Including IDE drives, SCSI, RAID, USB key drives, SATA, networked shared drives and external drives. - The size of the test file used. Larger files mean that the system cache has less of an effect on the test types, which use caching (see below). - The size of the data block used for each read or write request. Larger blocks mean less requests and can lead to an improvement in performance. - The choice of four access methods - C/C++ API, Win32 API cached / uncached and raw disk access. 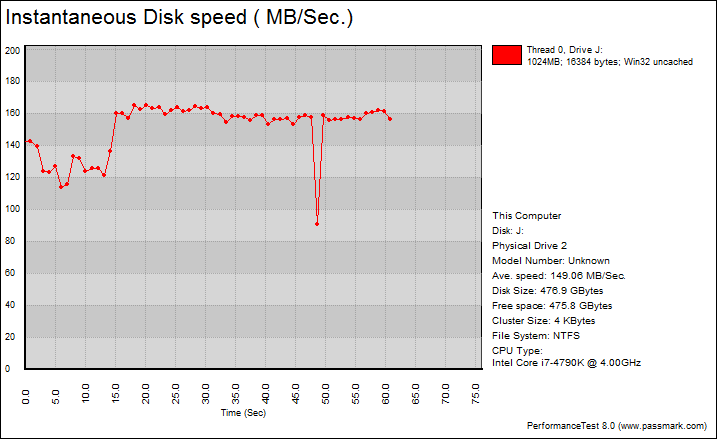 PassMark PerformanceTest 8.0's Advanced Disk Test, unlike HD Tune Pro 4.60, generates some awesome graphs right out of the box. It also provides valuable insight in simulating real world performance applications. To make things clear to you, the first graph simulates a database server, followed by a file server, web server, and workstation. Obviously, PassMark PerformanceTest 8.0 uses highly compressible data in most tests some controllers can really take advantage of. 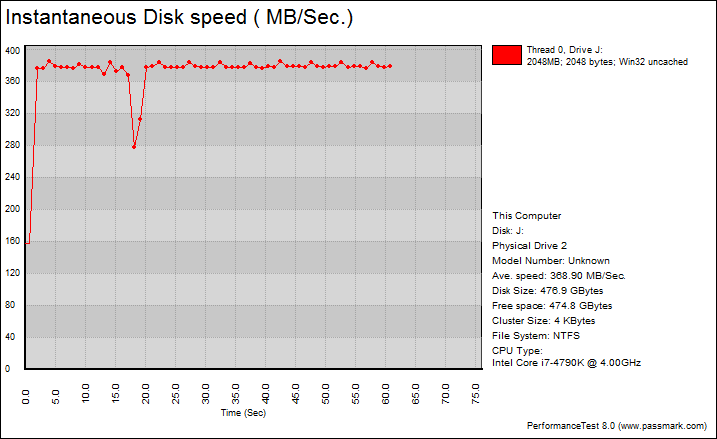 However, it also requires high IOPS capabilities for the best score. Many of the latest SSD controllers perform pretty well in this test. One thing clear is the OCZ RD400A 512GB provided incredibly flat graphs, which is excellent if you are looking for consistent performance. Overall, this NVMe solid state drive's performance continued to dominate the competition. With results of 368.90MB/s, 1170MB/s, 1121MB/s, and 149.06MB/s, respectively, this was a considerable improvement over the OCZ RevoDrive 350 480GB at 182.65MB/s, 1084MB/s, 1062MB/s, and 94.53MB/s, in the same order. Compared to the Kingston HyperX Predator PCIe 480GB, results of 18.24MB/s, 566.66MB/s, 1059MB/s, and 117.52MB/s was simply no match for the OCZ RD400A 512GB either. The OCZ RD400A 512GB was untouchable in our last five benchmarks sets, and here in PassMark PerformanceTest 8.0, it continued to be the undisputed winner in taking home high scores.